On Thursday October 12, the Y2 class took a break from the monotony of classes and college essays to attend the annual Hannah Arendt Conference at Bard College. 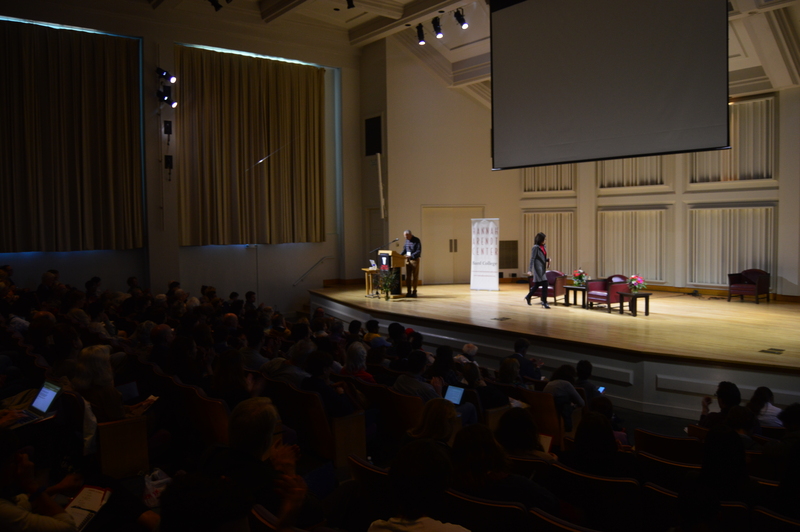 This year, the theme of the conference was “Crises of Democracy.” The conference was an opportunity to hear from acclaimed journalists, authors, and politicians, while exploring the Bard College campus. In the days leading up to the conference, our teachers had us read articles by the speakers, discuss them in class, and develop questions for the speakers. Our bleary-eyed assembly congregated in front of Whole Foods in Union Square at 6:45 am Thursday morning. Many of us were verbally harassed by an interesting man with a bicycle as we waited for the buses, which was definitely a good way to start the day. Once the buses arrived, we shuffled on and enjoyed a brief nap on the ride up to Bard College. The idyllic campus was definitely a change of pace from our noisy city lives. We admired – and were somewhat disturbed by – the peace and quiet as we filed into Olin Hall. We descended on the small plates of breakfast pastries like wild animals, and then headed into the main hall for the conference. The conference kicked off with Leon Botstein, the president of Bard College. Botstein welcomed us all to the conference and told us a little about the speakers we would hear from, dispensing wit and sarcasm along the way. Botstein discussed our political situation, focusing on the crucial impact media has had on current events. After Botstein spoke, Roger Berkowitz gave a talk about the conditions for a totalitarian state, and whether or not we live in one. All the BHSEC students heard from Berkowitz and the second speaker, Masha Gessen. After that, we split up into two groups – one remained at the conference while the other went on a campus tour – so our experiences were very different. The group that remained in the morning session heard from the activist Micah White and the activist/professor Zephyr Teachout, while my group heard from the author John Jeremiah Sullivan and the analyst Martin Gurri in the afternoon. Rather than attempt to summarize two very different conference schedules, I’d like to take a step back and discuss the Y2s’ reactions to the conference, based on what I’ve heard from my fellow students. On Friday the 13th – which was, superstitions aside, a rough day for my sleep-deprived classmates – we reflected on the conference in our classes. There were differing opinions on which speakers were the strongest, and whether the conference could be improved by having a more diverse group of speakers, more time for audience questions, etc. Something that nearly everyone I spoke to – students and teachers alike – agreed on was that Masha Gessen was a fantastic speaker. She commanded the crowd while remaining down-to-earth, made her talk both relevant and personal, and handled difficult questions from stubborn audience members with grace. She was the epitome of a great public speaker. The only criticism I heard was that people wished she’d spoken more. I learned so much from her talk – about the relationship between America and Russia, the power of language, and what it really means to have integrity. She actually responded to the questions asked, rather than just taking another opportunity to repeat her point. She was especially excited to answer questions from BHSEC students about how our generation can make the world a better place. But one of the things I admired the most about Gessen – and something that others faulted her for – was that she did not speak in depth about her gender and/or sexual orientation. She is a woman in a male-dominated profession and is married to a woman. These aspects of Gessen’s identity have fueled many of her writings, and she is considered one of the – if not the most – well-known LGBTQ activists in Russia. Her subject matter on Thursday, however, was not about feminism or LGBTQ rights. That’s not to say those topics aren’t important to Gessen, and I’m sure they’re never far from her consciousness. It was refreshing, though, to see an LGBTQ woman have a platform to talk about something other than being an LGBTQ woman – and to do so brilliantly. Usually when a woman has the rare opportunity to speak on the news or at a conference, it’s about women’s issues. When an LGBTQ person has this chance, it’s about LGBTQ rights. There is this presumption that the most interesting thing about a woman is their womanhood, the most interesting thing about a bisexual person is their bisexuality, etc., when in fact one’s identity is a lot more multifaceted. So it was wonderful that Masha Gessen got to speak about different facets of her identity, as a journalist who has been both a Russian in America and an American in Russia. She fully employed the parts of herself that were useful to her talk; that is what made it so riveting. She ignored the parts that weren’t pertinent for the time being. I wish the conference had given more people this opportunity – to explore their multifaceted identities. In my experience of the conference, besides Gessen, it was all rather monotonous. There were many white male – primarily liberal – speakers from middle-upper class backgrounds making similar points about how Trump was threatening democracy and needed to be stopped, with the presumption that the audience would agree with them. The conference didn’t seem to challenge anyone’s beliefs; it just reinforced them. For me, the main takeaways were a better understanding of the Russian-American relationship, a deep respect and admiration for Masha Gessen, and the recognition that, on the diversity front, we need to do better. There is a difference between tokenism and diversity, and most events I’ve attended embrace the former. It is such a rarity for minorities to have a platform for public speaking, and when they do, only allowing them to speak about being minorities is reducing them to less than they deserve. Human beings are always said to be more than the sum of their parts. You only recognize this in yourself when you are allowed to explore all parts of yourself and discover the sum. It is my wish for the Hannah Arendt conference, and other such events, that we give more people the opportunity to discover what is beyond the sum of their parts. This can only happen if we accept that people of any background can be the experts on any topic. Only then, can we engage in the sort of dialogue that may just move us out of “Crises of Democracy” and into a better world.